For those with even a rudimentary knowledge of pro football, names like Vince Lombardi and Bill Belichick may be familiar. But what of the other innovators and tacticians who have contributed to the development of the game? 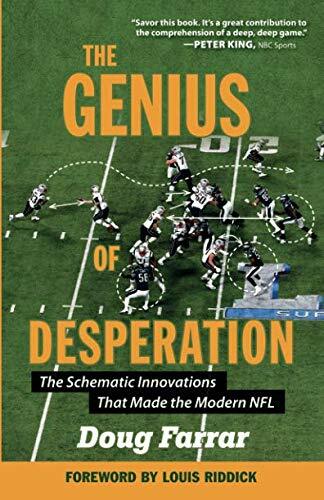 Doug Farrar’s The Genius of Desperation: The Schematic Innovations that Made the Modern NFL aims to give them their due. Basing his book on an overarching theme—that the strategies that have changed the NFL were born out of sheer necessity or desperation—Farrar rockets through the league’s history, demonstrating how cutting-edge schemes have impacted football’s transformation from primitive mano-a-mano clashes to chess matches played with modern, multi-talented athletes. As a prime example, he presents the short, precision-passing “West Coast” offense of Hall of Fame coach Bill Walsh, who developed the attack due to the fact that he was working with a weak-armed quarterback in Cincinnati. While some of these innovations have had more staying power than others (a moment of silence for the Miami Dolphins’ “Wildcat” offense, whose impact only lasted one season), others have had a lasting influence, such as Red Hickey’s “shotgun” formation, and the “option route” running of Darrel “Mouse” Davis’s “run and shoot” offense (which at the time was derided as “chuck and duck”). While there are plenty of familiar names in the narrative—as well as the aforementioned Lombardi and Belichick, Farrar also spends time on legends such as Tom Landry, Don Shula and George Halas—The Genius of Desperation is, above all, a useful primer on the unsung heroes of NFL history, such as Alex Gibbs, whose run-blocking schemes have influenced generations of coaches, or Clark Shaughnessy, whose innovations with the T formation paved the way for the passing attacks of modern football. Although the book’s title suggests that we’ll be exposed to the colorful stories of mad tinkerers, Farrar stays resolutely analytical in his approach. Taking his cue from Ron Jaworski’s The Games That Changed the Game (from which he liberally quotes), Farrar focuses on key formations and plays, which will be manna for any thinking-person football fan who appreciates the mind games behind the brute force of the sport. Be forewarned, however: The Genius of Desperation is decidedly not for football rookies. Farrar assumes that the reader has a solid foundational knowledge of NFL formations and history, so if you have trouble differentiating a single wing from a spread offense, or have no idea what an “Oklahoma drill” is, or are unaware of the significance of the 1958 NFL championship game between the New York Giants and the Baltimore Colts, then you may well be bemused and bewildered by these and other references he drops in throughout the book. Although helpful play diagrams are sprinkled in throughout, even those with a decent understanding of the game may have trouble keeping up with some of the head-spinning minutiae. While Farrar’s work has breadth, it’s short on depth; in his rush to chronicle the last century of football, each major tactical advancement is essentially relegated to a handful of pages, when further explanation and elaboration would have helped provide more insight as to how these schemes have shaken up the NFL. And though Farrar’s writing is solid, he lacks the literate touch or wry turn of phrase that would give his analyses more kick—the kind of polish that distinguishes giants in the field such as Sports Illustrated’s Paul “Dr. Z” Zimmerman. So even though The Genius of Desperation isn’t quite the foundational bible for pigskin geeks it wants to be, it remains an appealing survey of modern football. It also succeeds in reminding us of how rich NFL history is, with dozens of deep thinkers aligned along an evolutionary tree, forever dabbling with the tenets of the game and contributing to its growth as the most popular sport in the nation. Ho Lin is a staff reviewer at New York Journal of Books.